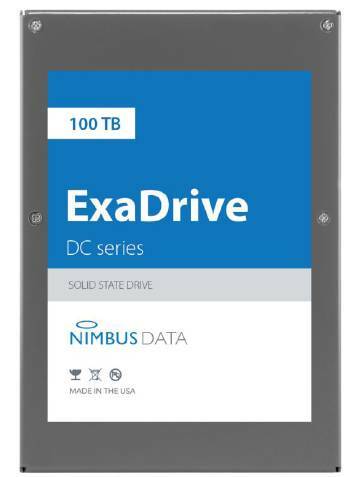 Nimbus Data has introduced its 100TB ExaDrive DC series SSD, the highest-capacity flash drive available. Intel, Micron and SK Hynix are basically nowhere in the very high-capacity SSD area. Samsung talked about a 2.5-inch form factor 128TB flash drive in August last year, which would use QLC (4bits/cell) and 3D NAND technology implemented as a package of parallel accessed 32 stacked 1Tb chips. Nimbus introduced a 50TB ExaDrive SSD in August last year, and Viking and SMART Modular Technology OEM'd it. The 100TB ExaDrive has a 3.5-inch enclosure, a SATA interface, and is built from MLC (2bits/cell) 3D NAND. It has, Nimbus claims, the lowest power/TB rating, down to 0.1W/TB, 85 per cent lower than Micron's 5100 drive. The random read/write IOPS performance is up to 100,000/100,000 – symmetrical – which is unusual as the majority if SSDs are skewed towards faster random read IOPS. The 100,000 level isn't "fast" as such; Toshiba's PM5 and Samsung's PM1643 do up to 400,000. This indicates that online transaction processing-type applications are not for this drive, which appears to be optimised for capacity and efficiency. IDC Research VP Eric Burgener said: "Devices of this class will allow flash to cost-effectively penetrate a broader set of use cases outside of tier 0 and tier 1 applications." The sequential read/write bandwidth is symmetrical too, being 500MB/sec, which seems low. The PM1643 does 2100/700MB/sec, while the PM5 offers up to 3,350/2,720MB/sec. Savings offered by the ExaDrive over these drives are physical space and power. A theoretical 100PB constructed from 3,264 Samsung PM1643 SSDs would need 6 x 45U racks, according to Nimbus, and around 50kW of power. The same ExaDrive-sourced capacity would need one rack, 990 drives and draw about 16kW. Nimbus suggests the ExaDrive DC 100 will cost cost 42 per cent less per terabyte over a five-year period than existing enterprise SSDs because of its greater endurance, lower power draw and other factors. Nimbus's 100TB drive offers unlimited write endurance for its five-year warranty period, which contrasts with the 1 to 10 full drive writes per day from the SSDs listed above. The "Unlimited" rating is almost an invitation to try and break it by writing to the drive constantly and seeing how long it would last. The ExaDrive also has a 2.5 million hours MTBF (mean time before failure) rating, capacitor-based power loss protection, several ECC engines, encryption and secure erase. The company suggests tier 0/1 data should be stored on NVMe SSDs, tier 3 nearline data (archive, DR copies, backup, cold data) on disk, with the ExaDrive being for the tier 1 and 2 areas. Deep Storage chief scientist Howard Marks suggests that hyperscalers might be the main customers for the ExaDrive DC 100, possibly with fast access archives in mind. He thinks you would need distributed parity across 50-100 drives to get an acceptable rebuild time for a failed drive. A RAID scheme with 10 drives might take a long time to rebuild if one dies.